Many modern track cars are offered with a dual-clutch transmission, but not the Ford Mustang Shelby GT350! No, only a 6-speed manual has been good enough for the GT350. At least until Ford dropped a 7-speed DCT into the new Ford GT and then (reportedly) got an idea. 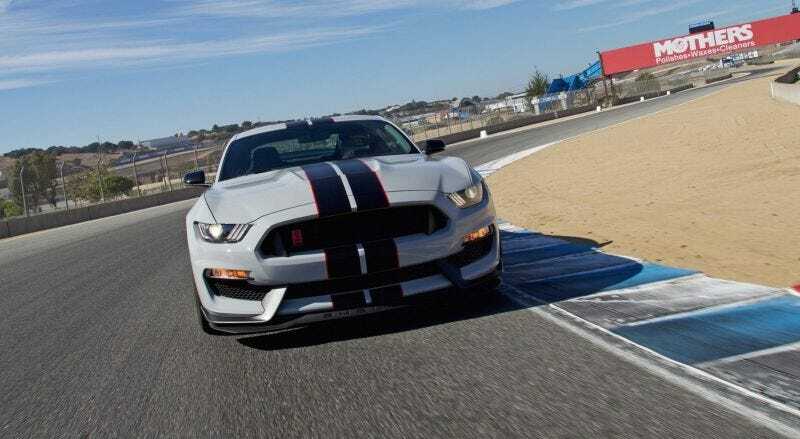 The Shelby GT350 is going to be getting a quick-shifting, track destroying dual-clutch sometime in the near future, according to details shared with Jalopnik by Mustang6g.com claiming to have spied on some dealer guides. The claim about the new DCT, possibly with 7-speeds as fitted in the new Ford GT, was wrapped up with the report that Ford would be extending production of the GT350 and its 5.2 liter flat-plane crank engine through to the 2019 model year, according to the engine’s builders at Ford’s Romeo plant. The details of the GT350's potential dual-clutch will apparently be offered as an option starting for the 2018 model year, with claims that more details are coming soon. We’ll keep you updated on that, but it sounds like the best performance car Ford’s ever made is about to potentially get even better.